Imagine telling your kid that you made those delicious pancakes for the blog and not for her! Konda was enjoying the treat and asked if she would get another serving, this time chocolate flavoured. I said I will make them again for her later. I was feeling so terrible saying that to her. Anyway I will make up to her soon I decided. So these were those detectable eggless Banana Pancake drizzled with Condensed Milk and season with Cinnamon. Sending this Champa for Kid’s Delight themed one Mini Bites. Did you see that Condensed Milk dripping from the Banana Pancake? It was yum! 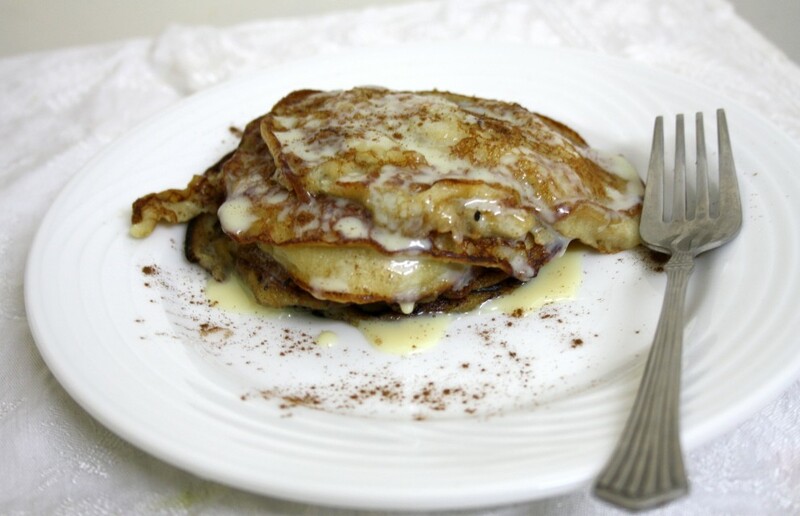 Eggless Banana Pancake with Condensed Milk and Cinnamon. Butter for cooking the pancakes. In a bowl, take the flour, mix in salt, sugar, baking powder. Puree the banana, add immediately to the bowl. Mix well to make sure you get a lump less batter. Slowly add in the milk and get a smooth batter. Rest it for 5 – 7 mins. Heat a non stick pan, drizzle with butter. Pour a small ladle of batter over the hot pan. Simmer the flame and cook over low flame to make sure the pancake gets cooked well. Meanwhile take the condensed milk in a microwave safe bowl. Micro for 30 secs. When the pancake gets done, flip on the other side cook till it’s golden in colour. Since the batter didn’t rest for long, the pancakes will not turn out crispy. So pour little thick pancakes and cook over low flame for it to get done well. Make sure you flip it with care. 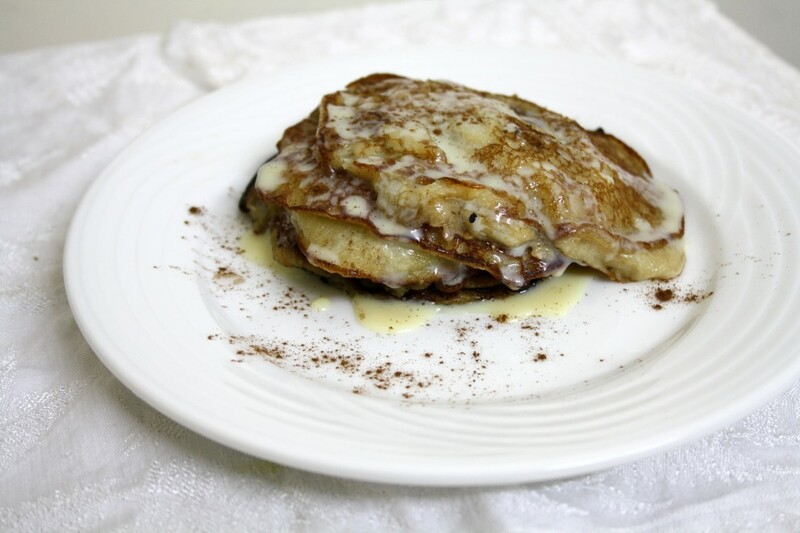 The hot condensed milk with cinnamon tastes heavenly with the sweet banana pancake. My angel too loves pancakes..Loved this one. Seriously feel like finishing that wonderful platter, yummy pancakes..
Hope you feel better soon………. Even I cook for the blog at times 🙂 DH often asks me before taking a bit" Is this for me or ur blog??? it looks pretty fancy" LOL I think when we have a food blog most of us are guilty of it 🙂 Hope u feel better soon…. Great and yummy dish for the kids..I think my son will love this one..will try this out..thanks!I hope you feel better soon. The drizzle on the pancake sounds so good. But my kids don't like anything banana. I tried, cakes, pancakes, muffins, breads – nope they refuse to take a liking. They would gladly eat the fruit as is!! I'm ashamed to say I've never thought of using condensed milk on pancakes instead of syrup. You can bet I'll give it a try next time, though! lovely pancakes..liked the garnishing too..
the name itself is so mouthwatering looks so tempting…Valli. Banana pancakes are the only kind I'll eat. I love the sweet condensed milk over the top! YUM! I wonder why take out the egg? Although I agree with you it does looks like heavenly to taste. Great recipe! Tried these today . Super super soft & tasty too. I did 1/2 cup APF and 1/4 cup Atta (Indian wheat flour).. This was the best tasting , fluffy, spongy pancakes I have ever made. And loved the condensed milk version.. Maybe even evaporated milk will work! Next time I need to reduce the qty as I was leftover with a lot of batter so I had to freeze it. Will use it in 2 days.